Most Christians believe that everything about Jesus and the early church can be found in their New Testament. In recent years, however, the discovery of the Gospel of Thomas and the reconstruction of the Q-Gospel have led scholars to recognize that some very early materials were left out. Now, due to the pioneering efforts of Dr. Aaron Milavec, the most decisive document of them all, namely, the Didache ("Did-ah-Kay"), has come to light. Milavec has decoded the Didache and enabled it to reveal its hidden secrets regarding those years when Christianity was little more than a faction within the restless Judaisms of the mid-first-century. The Didache reveals a tantalizingly detailed description of the prophetic faith and day-to-day routines that shaped the Jesus movement some twenty years after the death of Jesus. The focus of the movement then was not upon proclaiming the exalted titles and deeds of Jesusaspects that come to the fore in the letters of Paul and in the Gospel narratives. In contrast to these familiar forms of Christianity, the focus of the Didache was upon "the life and the knowledge" of Jesus himself. Thus, the Didache details the step-by-step process whereby non-Jews were empowered by assimilating the prophetic faith and the way of life associated with Jesus of Nazareth. Milavec's clear, concise, and inspiring commentaries are not only of essential importance to scholars, pastors, and students but also very useful for ordinary people who wish to unlock the secrets of the Didache. Milavecs analytic, Greek-English side-by-side, gender-inclusive translation is included as well as a description of how this document, after being fashioned and used 50-70 C.E., was mysteriously lost for over eighteen hundred years before being found in an obscure library in Istanbul. The study questions, bibliography, and flowcharts enable even first-time users to grasp the functional and pastoral genius that characterized the earliest Christian communities. This little book is a gem-learned, accessible, illuminating and challenging to both scholarly conventions and conventional Christianity. Students of early Christianity are in Milavec's debt, not least for his innovative website, www.Didache.info.
. . . a useful means of introducing the Didache to beginners. In recent times, the Didache, a significant first-century Christian manual, has come to be seen as a compilation of several older sources which are structured into clearly separated thematic sections belonging to different literary genres. Attention therefore often focuses on issues of source and redaction criticism. Professor Milavec, in dialogue with recent international scholarship, sets great store by allowing the internal evidence of the text to speak for itself. This volume, which looks at the unity of the manual against the cultural background of its time, is an indispensable addition to the literature on the Didache. It provides a gender-inclusive translation and a clear, concise, and inspiring commentary which is not only of essential importance to scholars, pastors, and students but also very useful for ordinary people. 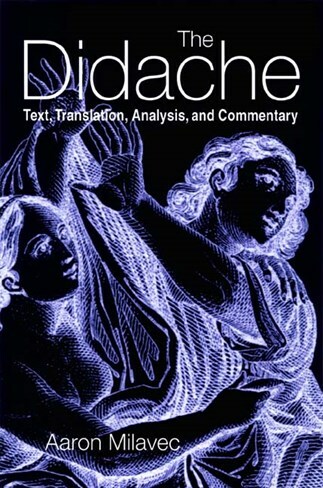 Dr. Milavec has produced a stimulating study of the Didache that gives full attention to the unity of the text and the pastoral sensitivity of its author, In this single, brief commentary, Milavec's masterful presentation of the text and his intriguing perspective upon the ancient origins and unique purposes of the work will undoubtedly provoke scholarly discussion for many years to come! Will undoubtedly challenge many who seek to understand the background and perspectives of the Didache. Milavec's newest book is the culmination of fifteen years of insightful scholarship into the mysterious text of the Didache. The parallel English analytical translation from the Greek is done with simplicity, yet with a sensitivity to gender issues and the Jewish background of the original text. This insightful new edition should appeal as much to erudite scholars as to the plainest of faiths. The commentary, the website, and the flow charts are brilliant additions. Milavec's work merits wide study and discussion especially because it presents alternative views and profound challenges to what has been the scholarly consensus on the development and interpretation of the text.
. . . Milavec's book is a very good introduction to the Didache, a stimulating and innovative work, a valuable tool for anyone interested in Christian origins, especially for an introductory seminar or course. Any future bibliography on the Didache will have to include this ambitious, impressive work. This is a book of rare quality and importance that has already been recognized by the most prominent scholars in the field as the fundamental reference work of the study of the Didache. In this new and landmark study, Aaron Milavec comprehensively examines how the first-century pastoral manual known as the Didache enumerated the step-by-step training of converts for the full, active participation in the earliest Jewish-Christian communities. . . . This is a book of rare quality and importance that has already been recognized by the most prominent scholars in the field as the fundamental reference work for the study of the Didache . . . Extensive indexes make the book an extrodinarily valuable research work. This volume, however, is significant by itself and provides for a wider audience a very accessible introduction to Milavec's work on this important document.
. . . stimulating in that it provokes discussion of the Didache. Starting in 1988 with his project concentrating on the text of the Didache, Aaron Milavec has since become a well-acclaimedif not thespecialist in this central source of the traditions of early Christianity. . . . Milavec's fine and fluent style gives his readers pleasure, and even those who are not familiar with the usual terminology may be relieved to find access to an important historical text in such a readable and knowledgeable way. . . . All in all, Aaron Milavec's handy commentary is a good read for all those who are curious about the development of early Christianity and its practice and methods but who up to now have refrained from challenging themselves with a thick and theological commentary. Aaron Milavec, author of a thousand-page scientific commentary of the Didache, presents a welcome and timely synthesis of his research. It is clearly written, accessible also to non-specialists, and of special interest for students, liturgists, catechists, and Church ministers. Milavec makes knowledge of the earliest Christian tradition assessable for a spiritual renewal today.